Some holiday cookies are clearly more about cuteness than flavor. Not these Macadamia-Lime Snowflakes. We'd eat these any time of year! Preheat oven to 350°F. Line 13x9-inch baking pan with foil extending over edges to form handles. Grease foil. Beat butter and sugar with electric mixer until light and fluffy. Blend in eggs, flour and baking powder. Stir in white chocolate, macadamias and lime zest. Spread in prepared pan. Bake 20 to 25 min. or until toothpick inserted in center comes out clean. Cool in pan. Lift out of pan using foil handles. Using 3-inch snowflake cookie cutter (or other shape), cut into snowflakes. Sprinkle with powdered sugar. Save scraps for snacking. 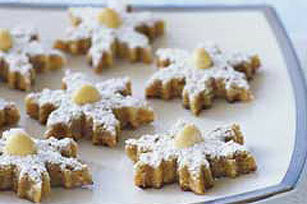 Include a snowflake treat in your holiday gift baskets. Insert macadamias into center of each cookie before baking. These can also be cut into 32 bars, if desired.